Today, we’re really excited to announce version 2.1 of Trigger.io’s mobile development platform: Forge. This version is hugely significant for us, as it marks a shift towards a more open, collaborative development approach on the platform. As part of this, Trigger.io is open-sourcing the native modules that we’ve developed. We’ve wanted to open source our modules for a long time, but before now there hasn’t been much point because it would have been so hard for our users to take our code and set themselves up to develop on it. With the changes described above, those restrictions are now gone, and we’re excited to announce that we are open-sourcing all of our own native modules under the 2-clause BSD license. If you want to tweak the form or function of a Trigger.io-created native module (e.g. customising the gradient of our topbar module, or extending our file module to capture audio as well as video), you can clone our code from GitHub and make the changes you want in your own module. You can keep that module un-published — meaning only you and your team-mates can use it — or you could publish the updated module so everyone benefits. Of course, we’ll always appreciate pull requests back to our repo so that we can update the original module when it makes sense! Note that we’re not open-sourcing everything. Our cloud build service, toolchain, and the core of our platform will remain under wraps: this means you won’t be able to do local-only builds that don’t use our cloud build service. But we firmly believe that the huge usability, speed and collaboration benefits you get from using a cloud-based compiler easily make up for that. Otherwise, head across to our site to create an account, download our lightweight tooling, and get started on your first app. The native module development process is covered in our documentation, and keep your eye on GitHub — we’ll be uploading and updating our module code there! It seems iOS 7 will be released sometime in the next couple of weeks, so today, we're pleased to share with you a preview of how your Trigger.io app will look and feel on the new OS. To run your app on iOS 7, you'll need a device with the latest beta build on it, or an OS X machine with the Xcode 5 preview installed. There are a few other iOS-specific updates we'll make to our modules over the next few weeks (in particular, enabling you to customise the behaviour and appearance of the status bar). In the meantime, if you find any problems with the updated platform or modules, get in touch! Last week we significantly revamped our docs and docs search. Which do you prefer, old or new? When we first launched our Trigger.io Forge development platform, our documentation needs were pretty straightforward. At the time, we only supported browser extensions, had a fairly limited number of “modules” (standardised cross-platform APIs to native features), and we were working on 2-4 week release schedule. Read the Docs was a great tool for us at that time. It handled versioning for us, it meant there was one less thing for us to have to think about deploying and serving, and we already wrote a bunch of internal documentation in ReST: we started throwing new documentation at it and were happy for a good year or so. When we started working on a native plugin system for our platform, we knew things had to change. “It’s not you: it’s me”, we said to Read the Docs, and started converting our own documentation to Markdown, using pandoc for a first pass, then lots of manual touch-ups. The thing is, we want the plugins our customers are writing to be properly documented, so that they can be effectively shared and used between and among teams and users. But, we can’t expect everyone to grasp the vagaries of ReST syntax, and the implicit assumption that Read the Docs projects are monolithic and homogeneous wasn’t really holding for us any more. However, the benefits of having full control over how our docs are stored, processed and delivered are yet to be fully realised. We’re looking forward to being able to easily give our users per-module, per-version documentation, to easily tweak the appearance of all the docs to track our website, and maybe even include runnable examples for API methods. Of course, taking control over our documentation like this has taken some effort. The biggest pieces were probably the conversion from ReST to Markdown (although pandoc did accelerate that quite a bit), and the generation of the navbar on the left side of our docs pages. But, once we had those in place, the clean, semantic HTML output from Markdown instantly looked pretty good with our Bootstrap styling. Integration of elasticsearch via Haystack was straightforward, and deployment just becomes a case of putting some HTML files in the right place. The level of maturity in those ancillary libraries and tools has reached a point where NIH-ing your own documentation system may make a lot of sense: it did for us! As the list of native modules keeps growing we ‘ll split that out from the core docs. But other than that we expect the basic docs structure and the way we host it to be stable for a while to come. We’re always trying to improve the content and make it easier to discover. So if you have suggestions or feedback, please do get in touch at support@trigger.io. We’d love to hear from you! When you’re developing software it’s easy to fall into the habit of ploughing through the backlog to knock off the most-requested features and highest priority bugs, iteration after iteration, without setting aside time to explore and experiment our product and our service. At Trigger.io, work on what you want week (wowyww) happens once a quarter: the idea is we give all our developers free rein to hack on anything they want, so long as it’s somewhat related to one of our products. This time around, wowyww produced a tile-based game built on our Forge platform using canvas elements, an improved analytical backend to help us understand what parts of the platform our customers use most, and a custom sound generator built on our shiny new plugin system. Here, I’ll let the guys describe what they did and why. What did I want to work on? Meadows & Randers and creating a simple tile-based game around it. Why did I want to work on that? I’m a firm believer in the principle of “Eating your own dog food” and wanted to get a real feel for the behavior & performance of our tools when used in anger. Getting to have a boatload of fun in the process was, of course, no small incentive! What was the result at the end of the week? No doubt I’m somewhat biased but my strongest impression of using Forge over the course of the week was how little time I spent thinking about Forge vs the amount of time I spent thinking about my code! I used the Trigger Toolkit primarily to create the project, manage my app configuration and deploying to a physical device. For rebuilding my changes and testing them in an emulator I opted to use our Command-line Tools instead. During development I also used Trigger Catalyst which provides a remote WebKit-style debugger. It’s an incredibly powerful tool but I found it could be a bit slow when your network connection is heavily loaded. This was my first time writing a game for a mobile device instead of the desktop so I wasn’t sure what to expect. It therefore came as a welcome surprise to find that I could populate a 2048×2048 pixel canvas with over a thousand bitmap tiles to create a smoothly scrollable game world without applying even the simplest of optimizations to my code. I wanted to try out our new native plugins from the perspective of a user. I wanted to make something fun that couldn’t be done without native code, so I decided to make a plugin to generate silly noises based on user input. Seeing things from the perspective of the user is a good way for us to find out if we’re doing things that make sense: this is especially important in a large project (like native plugins) where we have had to make a number of decisions and assumptions about how users will want to work. Acting as a user allowed me to see what worked well and what could be improved, and doing this while we are still developing native plugins means this feedback can be quickly applied in our development iterations. It also provided a chance to check our documentation made sense and to create a more detailed example of what a complete plugin looks like, rather than just the very basic example code we include with the inspector projects used to develop native plugins. Native Plugins for Trigger.io Forge: a simple sound generator. This sort of feature could be really useful when creating a game or other fun apps, and it demonstrates the power of native plugins and how you can go about coding them. All of the source is available on GitHub: https://github.com/Connorhd/forge-plugin-noise. Analytics on the config.json files submitted by our users when creating apps with our cloud build service. Users use the config.json file to specify what version of the Forge platform they want to use in their app, as well as which modules they need and various other metadata. This will hopefully lead to better insights as to what features our users really value in the platform, and generally help us keep track of the uptake of new versions of the platform, which lets us deprecate older versions at a pace which doesn’t inconvenience anyone. The analytics are live and we’re now able to get a better idea about what people are requesting from the Forge build service, in terms of both platform versions and modules. Most people seem to stay up to date with the Forge platform by sticking with the latest major version (currently v1.4), which always refers to the latest deployed code in the 1.4.x series. On the left we can see the most used modules: request, logging and reload are among the most popular. Now that we have a system in place for collecting these basic analytics from the build service, we should be able to measure more statistics on builds without too much work! Join James Brady, Trigger.io CTO and the team next Wednesday for our second webinar back by popular demand! This webinar is available to customers on our paid plans: sign up for a paid plan starting from a LIMITED-TIME OFFER of $19 for Go Iterate. This offer will be discontinued next week and the $19 rate will only be available with a year up-front payment after that. Trigger.io co-founder and CTO, James Brady, demonstrates how to setup your Apple developer center and Trigger.io environment for building for iOS and packaging for App Store submission. The Trigger.io team has been busy getting our platform ready for enterprise and with our integration with the Salesforce Touch Platform, we’re there! We’re based in the Touch Stadium / developer center in Moscone West. You can come and meet the founders there and watch our CTO James demo Trigger.io at 3:45 on Wednesday. It’s a busy week on the blog: today we’re pleased to be announcing the online publication of the Trigger.io white paper. We’ve written this as a tight, 23-page overview of the mobile development landscape, HTML5 opportunity and how our product fits into it. With the app market still exploding, and so many routes to entry – different platforms, different languages, different cross-platform frameworks – accessing that $15bn market isn’t as straightforward as it should be. Our platform is all about making it as simple as possible to build native apps and to access that market: and our white paper is an extension of that mission. And whilst I recently wrote a more technically-focused post on how developers can make sense of mobile development platforms, we want the white paper to explain the context of what is happening in the industry to a general audience, and help developers lobby the company-internal case for our platform. We hope it’s particularly helpful within companies facing the need to build for mobile but finding the landscape confusing. We’ve filled it with facts, but it’s opinionated too: we make the case for Trigger.io as the single best solution out there. To start, we address the growth of mobile apps and touch on the need for businesses to build a platform-agnostic presence on mobile and on the web (closing their viral loops). How to go about building for that need isn’t straightforward, and section two addresses some of the considerations developers face in choosing a route through the mobile programming landscape. Which platform, language and app market is worth investing in? How do cross-platform frameworks fit in? Section three unpacks and explains the strengths of HTML5 and cross-platform apps, from how they work to how to best take advantage of community tools and libraries to build the best hybrid apps possible – the best of both worlds. HTML5 hybrid apps aren’t going to suit graphically-intense applications and games: some kinds of app are going to be better served by native builds (a false dichotomy which refuses to die). At the same time, with HTML5 standards and browser tech improving so rapidly, a lot of lazy prejudice is already outdated: here we survey some of the potential hurdles of working with HTML5, and offer some solutions for dealing with speed and native look and feel, using third-party libraries and other tips and tricks. The paper also includes a couple of case studies of good cross-platform practise, and a high-level untechnical run-through of how to build your first Forge app, from concept to app store. We hope it encourages you to dive in and give it a go. Here’s the link again. This will be a living document that we’ll regularly update to reflect the evolution of our platform, and the evolution of the industry. Comments? Feedback? Typos? Let us know. Mobile development platforms are so hot right now that even video ad networks want to launch one. “App cloud” is to 2012 what “pet food” was to 1998. Firstly, mobile app development is exploding – Gartner said app store revenue would reach $15Bn in 2011 – because consumer attention on mobile devices is shifting to apps, away from the web. But mobile app development is hard because you need to know all sorts of different languages: Objective-C for iPhone / iPad, Java for Android. And any serious app needs a remote data-store so you get into the business of provisioning servers and write Ruby, PHP or Python. Kudos to Kinvey and RWW for making this attempt and this graphic does in fact contain all the top mobile platform companies. But unfortunately, this doesn’t really help a developer trying to decide what they need, much like London Underground maps makes little sense to foreigners. So let’s really boil this down to make it simple. Basically, to create a mobile app, you need some code that runs on the server-side (the cloud) and some on the device. Ok, let’s talk about the cloud bubble. The simplest server-side (aka back-end) is where you don’t actually have to write any code – instead you call some remote API that provides the service using code someone else has written. This is a BaaS – a backend-as-a-service – and examples are Parse, StackMob or MongoHQ for data-store, Pusher for notifications. They are the top level in the server-side stack and provide the maximum ease for developers. They often provide an iOS or Android SDK so you don’t even need to deal with the mechanics of calling their server-side APIs directly with an http request. But if they don’t provide the exact features you need so you want more flexibility, then you have to go lower in the stack and write some code to handle your server-side logic. At this point you decide whether you want to customize a Rails or Django setup, or if you just want to write Ruby and Python and be done with it. In the former case, you’ll want to provision a server on Amazon’s EC2 (Infrastructure-as-a-Service) and start installing software. In the latter case, you don’t need to. You can just use a Platform-as-a-Service, like Heroku or Google App Engine, that provides a Rails or Django runtime out of the box. The code you write on the client-side is going to be deployed to a device that is going to be running an Operating System such as iOS or Android. This is where you write Objective-C on iOS and Java on Android. The upside is that you can use the full-power of the device and have the maximum flexibility in how your app works. The downside is that you need to create and maintain multiple codebases if you want to support multiple platforms. And, if you’re a web developer, you need to learn new, strange languages that need you to get yourself setup to compile. Those disadvantages are show-stoppers because consumer attention on mobile is moving to apps away from websites. Firstly, there is some kind of ‘native wrapper’ which lets you distribute your HTML5 code as if it were a native app, so you can get distribution in the App Store and Android Marketplace. Some hybrid development frameworks even let you write your own native code if you really want to, sitting side-by-side with your HTML5 code so you can mix and match as you like. 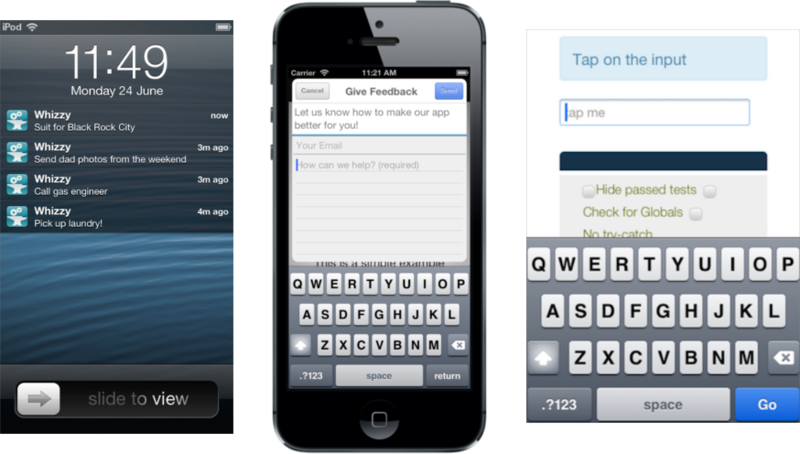 Examples of development platforms for hybrid apps are PhoneGap, Appcelerator and Sencha Touch 2. To get the best of both HTML5 and native, some frameworks need to sacrifice the simplicity of the development process. For example, with Appcelerator, you need to use their own IDE. And to use PhoneGap’s open-source native wrappers, you need to set yourself up for local compiles in Eclipse or XCode. If you use a cloud build service, such as PhoneGap Build, you save yourself from needing a particular IDE or setting up for local compiles. But instead you need to zip up your code and upload it into a web form and wait several minutes while your native apps are queued and built, then download them from the web ready to test. Users can tell the difference between an HTML5 app and a native app, and the latter are inevitably better. These problems with existing client-side hybrid frameworks are why we founded Trigger.io. We provide both a super simple development process and genuine native UI components. We’re the only mobile platform that provides this, and judging by our growth and the quotes we’ve published on our homepage, developers like it. The reason we can do that is we run a cloud build service so you don’t have to setup your machine for local compiles but we can still add genuine native features. And we’ve been smart about building it so incremental builds take < 2 seconds, making for a very nice development flow. Check out our screencast, or judge it for yourself by signing up for free now. We hope this has helped you make sense of mobile platforms being able to categorize them as making the server-side or client-side part easier, and then breaking them down further within those categories. Questions? Thoughts? We’d love to hear from you at support@trigger.io and hope this inspired you to try our hybrid app development. There’s a lot of heavy lifting that goes on behind the scenes to make it that simple, and one unique aspect of our Forge framework is how our build service compiles our customers’ apps – by splitting the build between local tools and a remote server. The approach keeps users’ local development environments as simple and platform-agnostic as possible, and allows our servers to run multiple platform compiles in parallel to deliver the builds faster. End result: the normal development cycle is orders of magnitude faster than it is with other solutions, with builds taking seconds at the command-line rather than minutes to compile or requiring you to zip up and upload code through a web interface. Here’s a run-down of how Forge builds work behind the curtain. On executing the build, Forge will (1) take the contents of your config file and fire it off to our server – we run Django and nginx, all hosted on EC2. Receiving the build request, our server matches your ID and config.json contents up against your account credentials to determine which platforms need to be built, and then compiles a template app for each of the given platforms – creating a specific template that will reflect the features you’ve enabled and disabled in the config. On our end, the build is then (2) farmed out to separate build servers: both to run the compile with the appropriate back-end hardware, and so that builds can run in parallel and so return much faster. Speeding up template creation is an ongoing goal for us: we have recently had good performance gains by creating a caching minification service to avoid JVM startup lag, and we’re trialling the use of RAM disks to cut down our I/O times. (3) The template apps are returned to your machine, along with build instructions that dictate to the local build tools how to complete the final stages of the build locally. At this stage, the “Your code” green hatched section is effectively empty. By compiling on the server, we save the user from setting themselves up locally for compiling for different platforms. We take on all that complexity, which means we don’t dictate what you need to write and work on your apps – whether that’s in TextMate, WebStorm, Eclipse, XCode, Aptana, whatever. Our framework remains platform-agnostic, and just a text editor and command line will do. By returning instructions for the final stage of the build to your local tools (rather than encoding them permanently in the tools), we ensure that there are as few as possible version clashes between your build tools and the Forge platform level you’re building against. We’ve already pushed out dozens of fixes and improvements to the Forge platform which take advantage of this loose coupling to avoid imposing constant build tool updates upon our customers. Lastly, we run Node.js-based end-to-end system tests before pushing new code out to the platform – to check that apps that have already been published through our platform will continue to function just the same after pushing the update. All this to say that we’re proud of our back-end build system, and hope you see the value in the way we approach it. It offers our customers faster builds, less hassle, and let’s them push out streamlined, unbloated apps from unbloated environments. Interested? Give us a try.